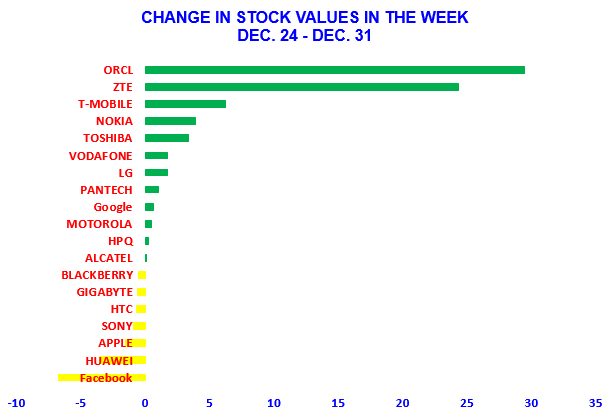 The analysis of the changes in the values of stock of 20 leading IT companies, during the last week of December 2013, i.e. from December 24 to December 31, 2013, shows that this week was, as a whole, good week for the IT companies. The table contains changes in the values of stock of 20 leading companies. As a whole the stock of leading IT companies changed by 3.04% during the last week of December 2013, i.e. from December 24 to December 31, 2013. The stock of IT companies which faced reduction in their values are; Facebook, Huawei, Apple, Sony, HTC, Gigabyte and BlackBerry. The stock of the companies, the values of which were increased during the week are; Oracle, ZTE, T-Mobile, Nokia, Toshiba, Microsoft, Vodafone, LG, PANTECH, Google, Motorola, HPQ and Alcatel. As per data analyzed, 7 out of 20 IT companies faced the reduction / negative change of 2.08% in the values of their respective stock while the 13 companies had the positive change of 5.79% in their values.